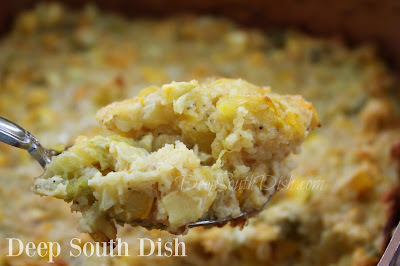 A cornbread dressing made with yellow squash, sauteed with onion, celery and bell pepper. I hear from a reliable source that squash is starting to come in! I didn't plant any this year so if you're trying to get rid of some, stop on by with a bag and I'll gladly take some off your hands! For some reason, I never see pattypan squash around here, not even at the farmer's market, but yellow squash happens to be my favorite in the summer squash family. I like it far better than zucchini, though I do eat both. I think yellow is a little sweeter and more mellow than zucchini but both make pretty good zoodles. I like it sauteed and smothered down with some onions, stuffed, in casseroles, as a dressing, in gratins even fried, but have you ever tried yellow squash creamed? Think, creamed corn as far as texture goes, but with a concentrated squash flavor. Just fabulous. Hope you try it sometime! 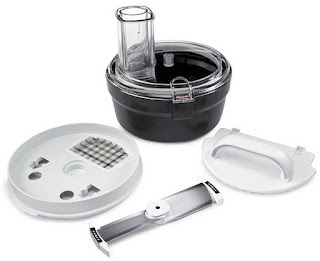 Normally I would chop the veggies for a dressing, but this time I decided to dice everything using the dicing kit attachment for my KitchenAid food processor. The difference between dicing and chopping, is that chopped veggies have very little continuity in size and cut. When sauteed, they sort of just melt into the skillet, generally as intended. Diced vegetables, on the other hand, are uniformly square, and hold their texture more once cooked, resulting in a completely different texture and flavor from sliced or even chunks of vegetables. You certainly can just chop though! Use whatever cornbread you have, leftover from homemade, store-bought from the deli, or made from a packet or box mix, though keep in mind those generally contain some sugar, some more than others. Traditionally, these dressings are made with condensed soups in the south and often cream of chicken. I recommend using the Great for Cooking version rather than the green label variety, at least the first time you make it. That way you have a baseline if you change to a Healthy Request or other lighter versions of the cream soups. You can also make your own homemade substitute of course. Here's how to make it. As always, full directions with measurements and a printable copy are available, further down the page. Preheat oven to 350 degrees F. In a large skillet, melt butter over medium heat. Add onion, celery and green pepper; saute until tender, about 3 to 4 minutes. Add garlic and cook another minute. Add squash, cook and stir for 2 minutes; stir in cream soup, stir until heated through and remove from heat. Add cornbread crumbs and seasonings; mix well. Stir in eggs and transfer to a greased 11 x 7 inch baking dish. Bake, uncovered, at 350 degrees F for about 55 to 60 minutes, or until golden brown on top. For more of my favorite squash recipes, visit my page on Pinterest! Preheat oven to 350 degrees F. In a large skillet, melt butter over medium heat. Add onion, celery and green pepper; saute until tender, about 3 to 4 minutes. Add garlic and cook another minute. Add squash, cook and stir for 2 minutes; stir in cream soup, stir until heated through and remove from heat. Add cornbread crumbs and seasonings; mix well. Stir in eggs and transfer to a greased 11 x 7 inch baking dish. Bake, uncovered, at 350 degrees F for about 55 to 60 minutes, or until lightly browned on top. Actual time will depend on your oven. Cook's Notes: Double recipe for a 9 x 13 inch casserole. I used 1/2 of an 8 x 8 inch pan of cooked Jiffy cornbread, crumbled to get 2 cups. If you prefer not to use condensed soup, make a homemade substitute. Thank you for this recipe! A friend of mine gave me a similar recipe, marvelous, but it makes enough for a Thanksgiving crowd or army battalion! I've tried to cut his recipe down and never gotten it right. Question: can you think of a sub for the cornbread? We love it but our biggest squash lover can't have corn. Leave it out? or maybe herbed bread stuffing mix? Panko? Croutons? You can sub! I have two other similar recipes, one has crushed saltines on top, the other with crumbs made from toasted bread. You can find them both linked at the bottom of the recipe, just below the Print This button above. Hi Mary: Thanks for this delicious and versatile recipe. I made it with zucchini and one 6 oz. package of Stovetop cornbread stuffing to serve with barbecued spareribs. It was wonderful!